As September 2013 winds down I have some photographs and notes to record. This is the fourth of several posts. 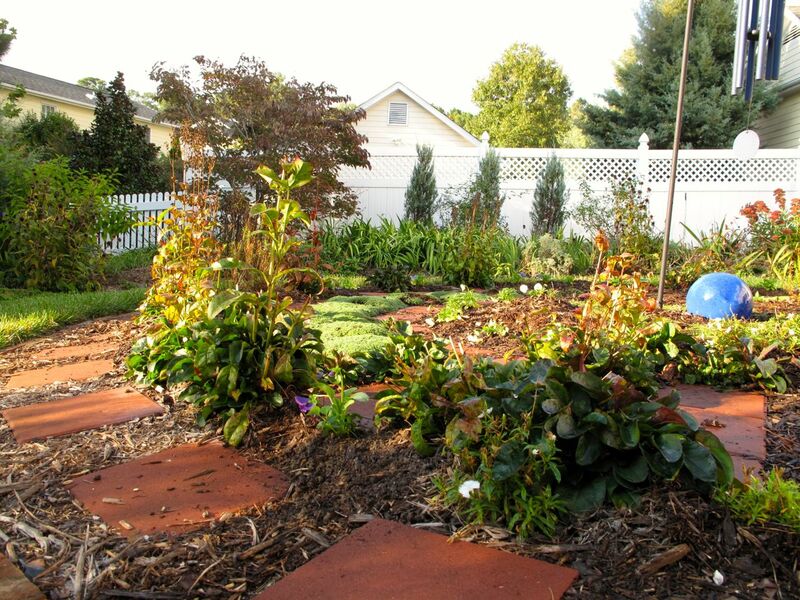 Experience starts the moment you start to like gardening. You can’t do it right the first time. You can’t even do it right in a few years. You always see the next step you have to do. 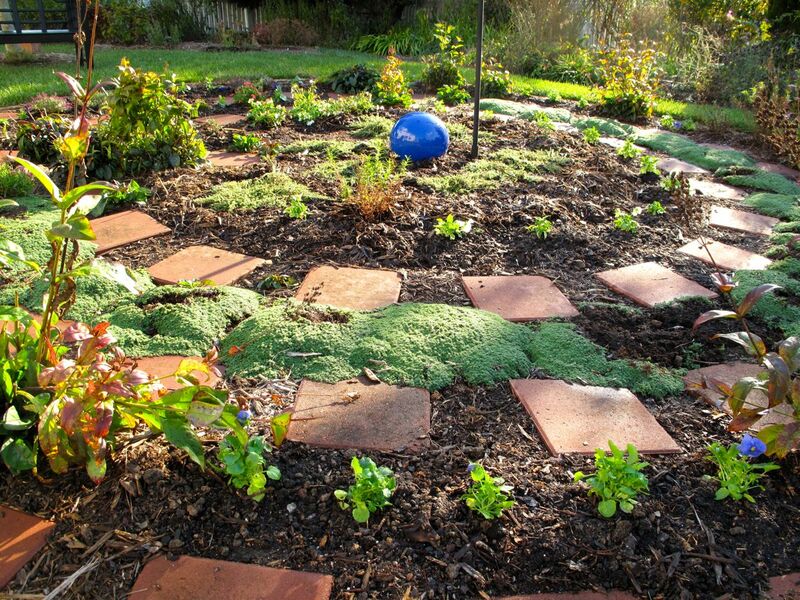 Start simply, putting good combinations of plants together, and work from there. You have to go through all the steps. You cannot skip any lessons. That is honest. It’s hard work. But you get something back, that’s the good thing. It’s like raising children. You try to do your best. To read the entire interview see: The New York Times, HOME & GARDEN, Q&A: Piet Oudolf on Designing a Winter Garden, By SARA BARRETT, Published: February 9, 2011. The Dutch designer shares advice on getting the most out of your garden all year round. 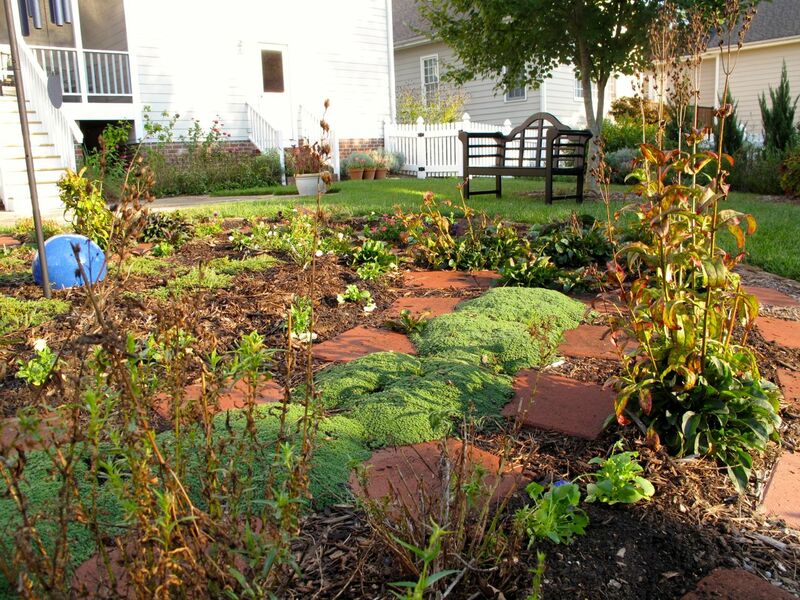 This entry was posted in garden, pbmgarden renovation and tagged garden design, garden journal, garden renovation, gardening advice, Piet Oudolf on September 30, 2013 by pbmgarden. As September 2013 winds down I have some photographs and notes to record. This is the third of several posts. Sometimes pictures of my garden are just too ugly to show. 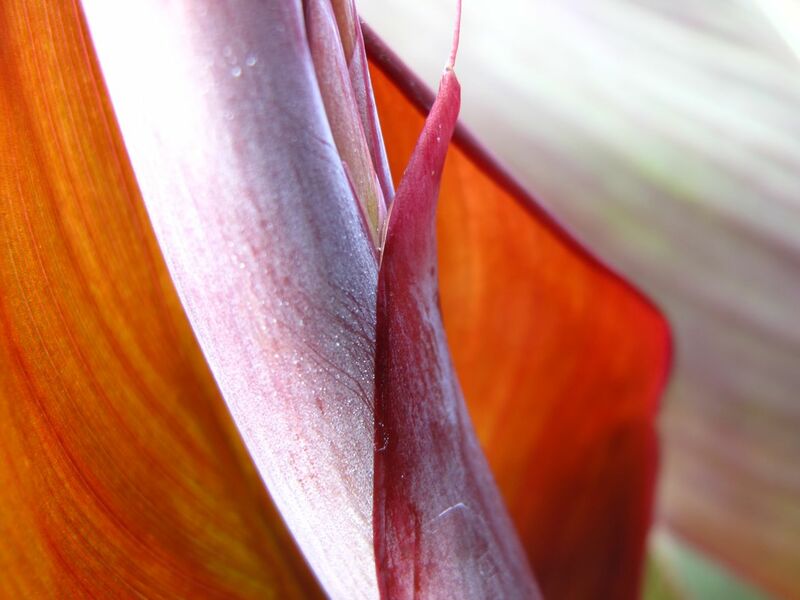 I think my photography has improved more than my gardening skills since I began blogging, as I try to find ways to show parts of the garden without revealing how it all really looks. 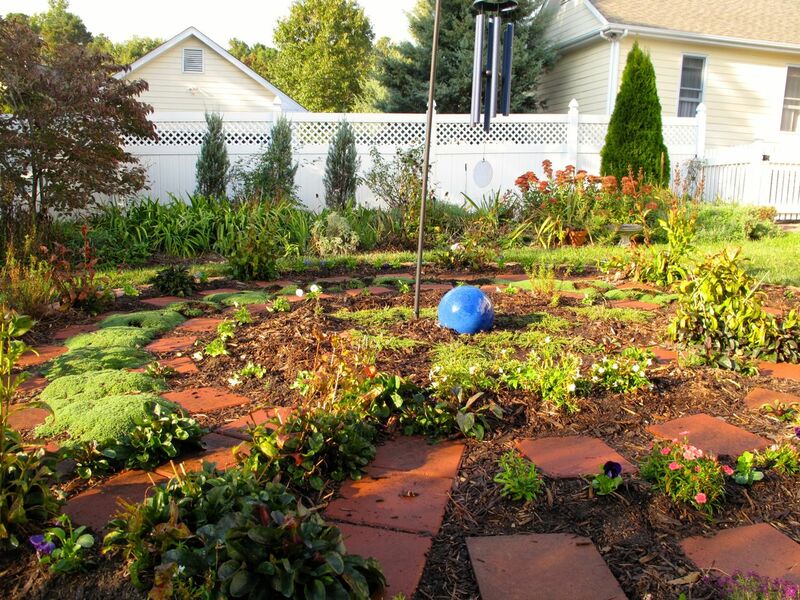 No one wants to see, I reason, the spent flowers or unweeded patches, the air conditioner units or brick foundation, the odd item left out of place on the patio, the neighbors’ cars or such. And of course I want to show the garden at its best. So often the views I show are from the same points, where I can compose an image that hides some of the truth. 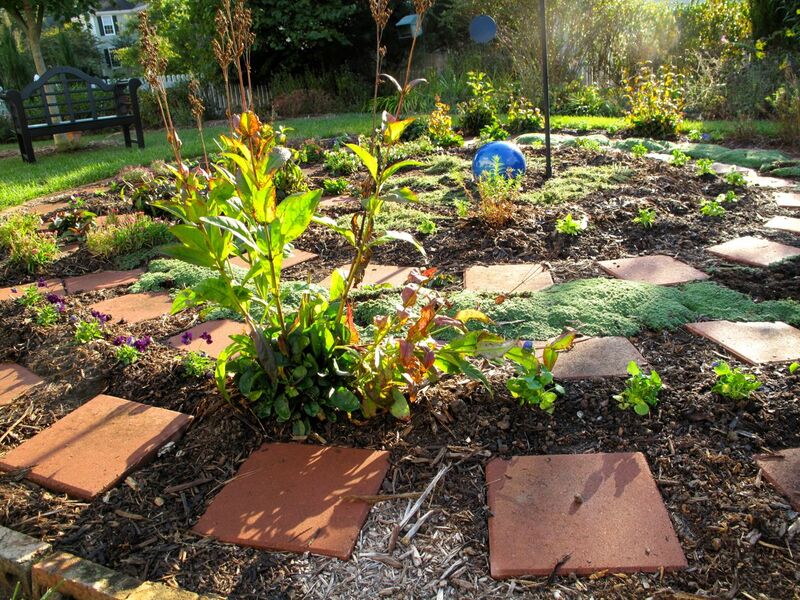 But I started pbmGarden in January 2011 as a way to plan and design changes for the garden. 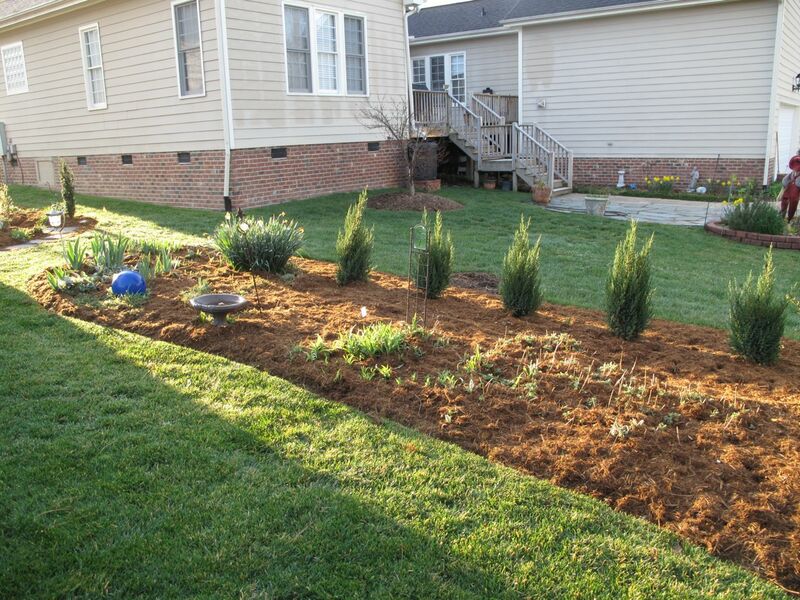 The blog was to be a way to work out ideas and document the progress of the garden. I was reminded of that point when I looked at yesterday’s pictures of the Southern border, compared to images from when I first began the blog 2.75 years ago. In the picture above, taken yesterday, I was down on the ground trying to capture the freshness of this Echinacea about to bloom in front of French Lavender. 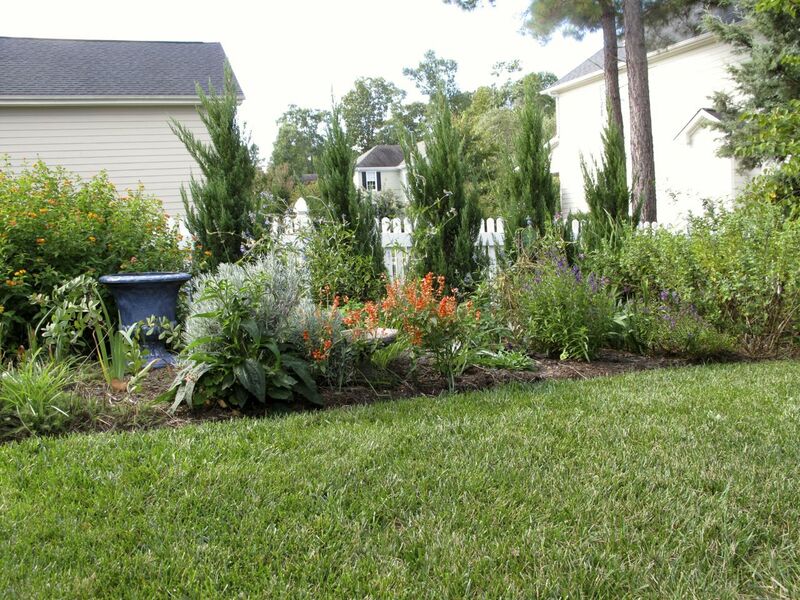 The salmon-colored Salvia should be in the frame as well. Oh, and I told myself to try not to show utility boxes on the side of the neighbors’ house. Below, here is another view from yesterday of the same area, looking from the middle of the garden toward the Southern border with its Blue Point Juniper hedge. Among other criticisms I was struck by how much flat wall I could see of the neighboring houses. But it is actually helpful that photographs can go beyond the photographer’s vanity to show an honest record. When I look back at that border just after planting that hedge in February 2011 it is clear to me I have made some progress in this garden. 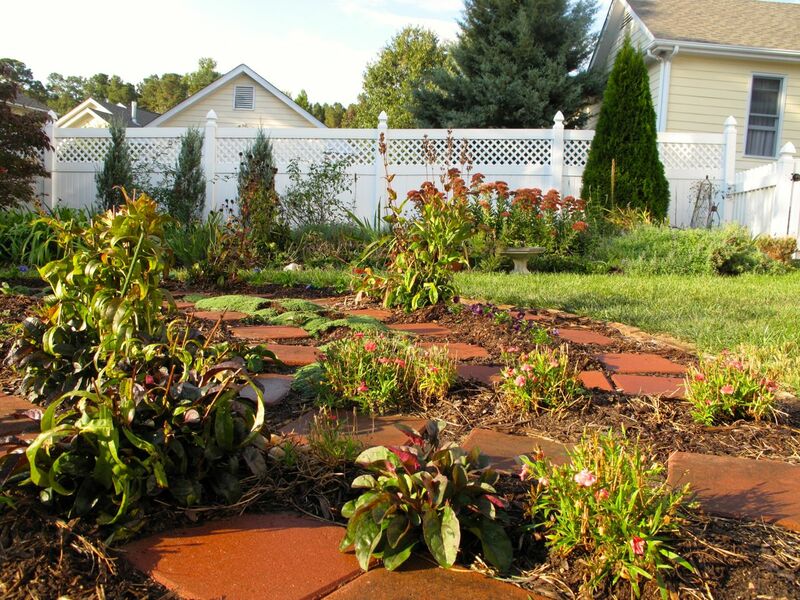 One of my big goals at the time was to gain some privacy so I could better enjoy gardening. Looking at the Southern border then one could easily understand why this was important. The yards were wide open. Standing in my yard a month after the Blue Point Juniper hedge had been installed and looking toward the Southern Border (and the neighboring house beyond), I realized privacy was coming no time soon. 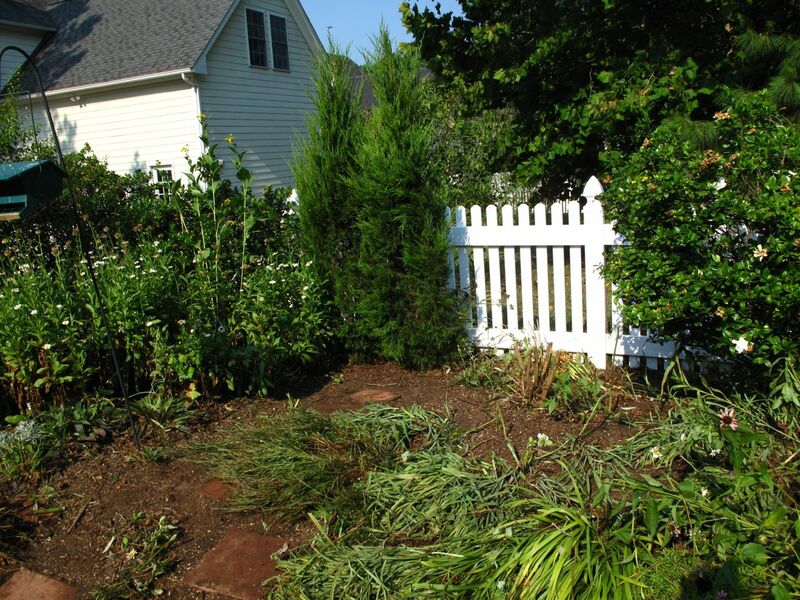 I began making arrangements for a fence. 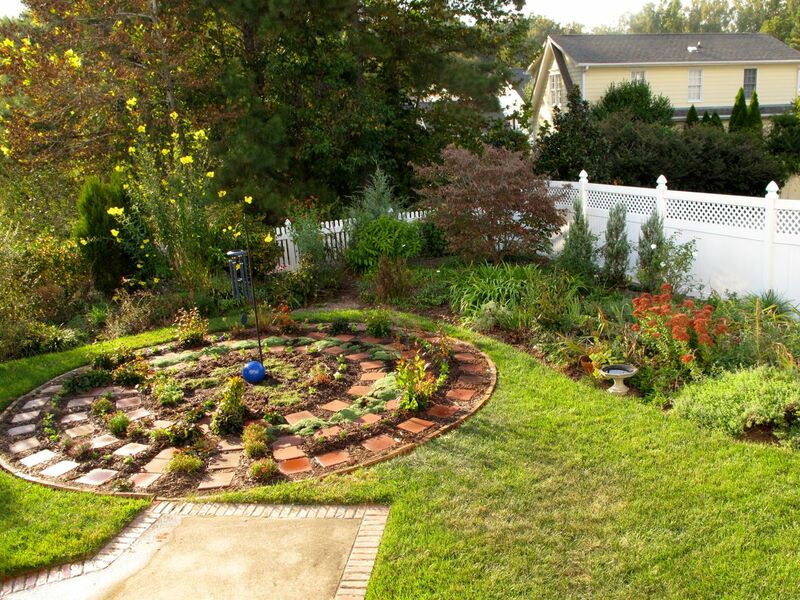 The fence was a costly budget item for this garden but when now when the lantana and other perennials die back in this winter, the garden will still retain a sense of enclosure and privacy. 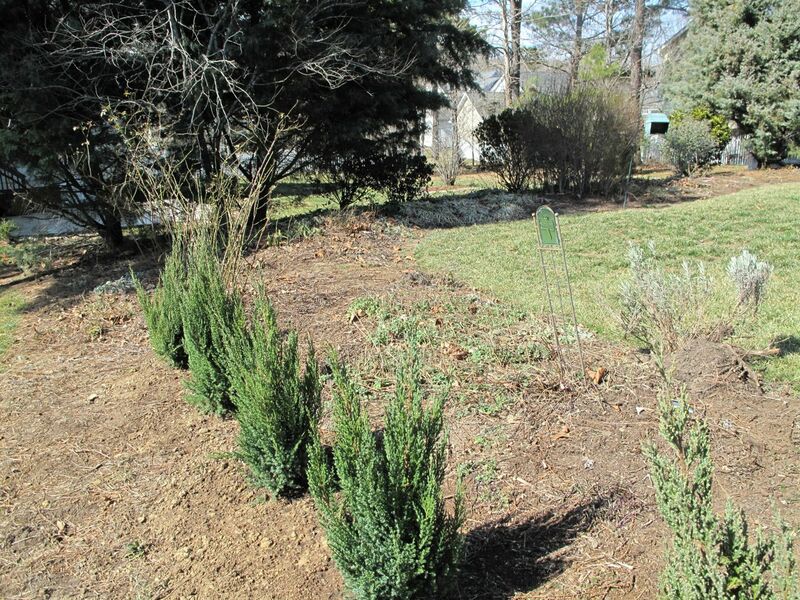 Standing at the opposite side of the garden, again looking toward the Southern border, I notice how much the Blue Point Juniper hedge has grown. While looking back through some photographs of the garden’s history today I was reminded how helpful it is to have lots of those images that tell the stark, ugly truth. 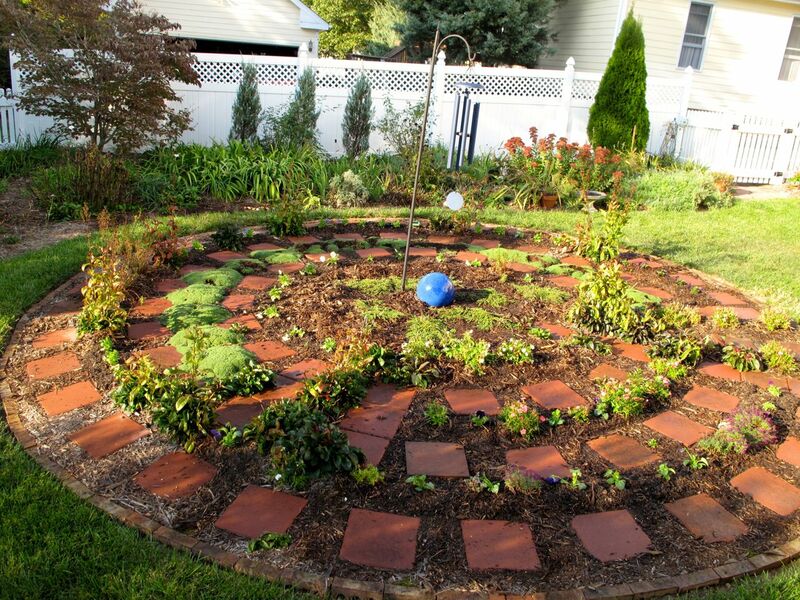 They are useful in evaluating progress and in setting and recalibrating goals for the garden. Of course for the blog it is always fun to throw in a beauty shot as well. 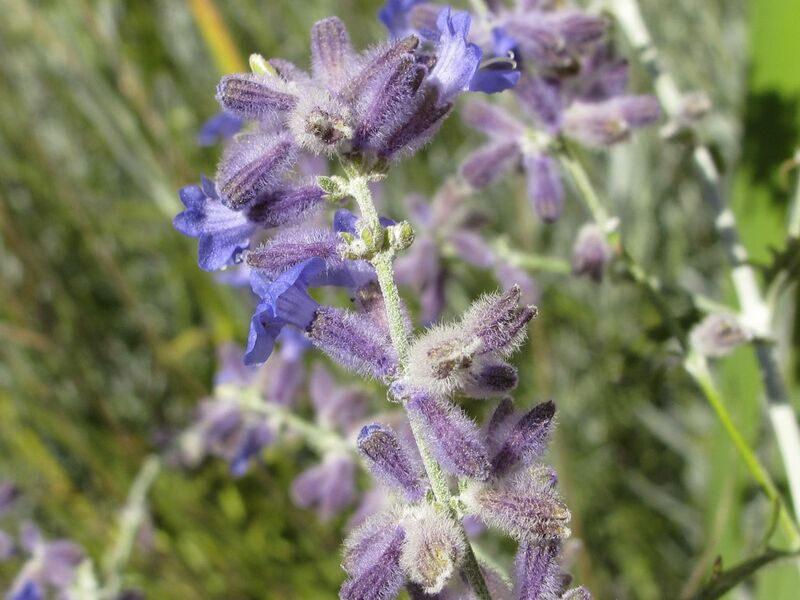 Perovskia atriplicifolia (Russian Sage) is blooming in several places around the garden. 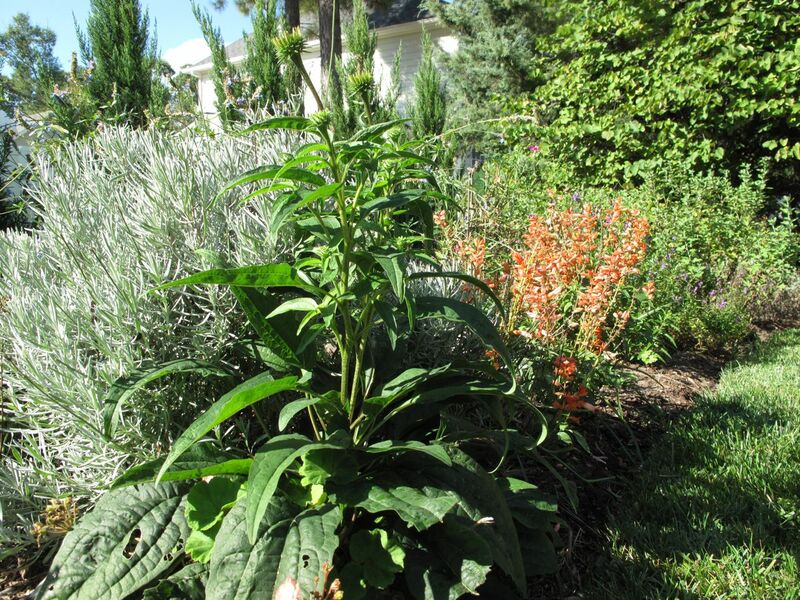 This entry was posted in garden, pbmgarden renovation and tagged Autumn Joy Sedum, echinacea purpurea, garden journal, garden photography, lavender, Perovskia atriplicifolia, salvia on September 29, 2013 by pbmgarden. Today there are overflowing puddles and bird baths and even the grass has lost its crispy texture, but the garden is changed. In our absence yesterday a heavy wind and rain storm passed through. Neighbors said it was fierce and significant, but everyone was surprised to see the trees down. Returning to the neighborhood, first I saw a next-door neighbor’s small oak tree had almost broken in half, the top had just folded over toward the ground. 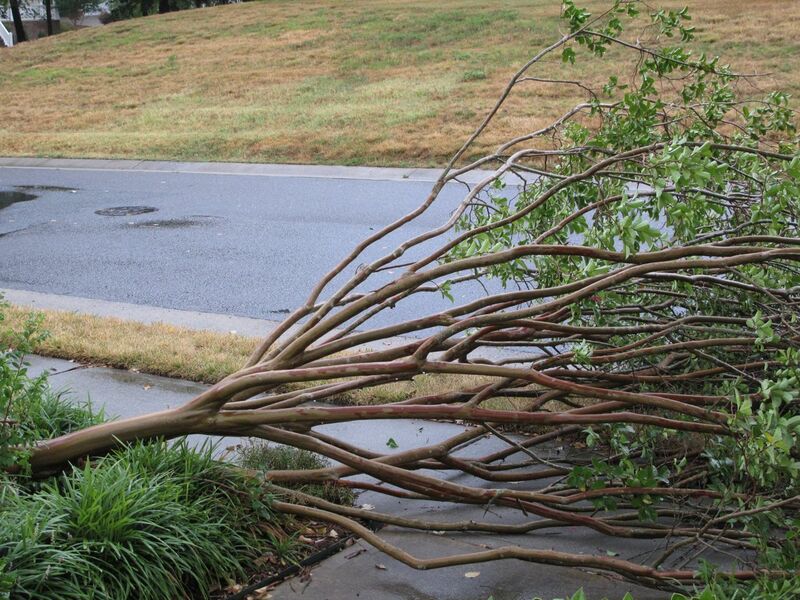 Just beyond at our house, an almost-blooming Crape Myrtle had snapped at the base and was lying in the street. Its twin stood sturdy and strong, but missing its partner at the front walk. One of a pair of Crape Mytles snapped at the base during a storm. Not having seen the storm ourselves it was difficult to imagine what in the world had happened. The house seemed fine and was. Of course I was curious how the garden had fared. Ahh, a pine tree! We do not own any, having learned our lesson many years ago about living under pine trees. They fall. They lose their tops. I did not need the reminder, but here it was and sure enough pine trees do still lose their tops! And even if a pine tree belongs to the back yard neighbors, a pine tree’s broken top can suddenly become one’s own problem. Amazingly the pine fell inside our fence, rather than crashing down onto it, so the fence is not damaged. The meditation circle was filled with pine cones and a few small branches, but is otherwise unscathed. 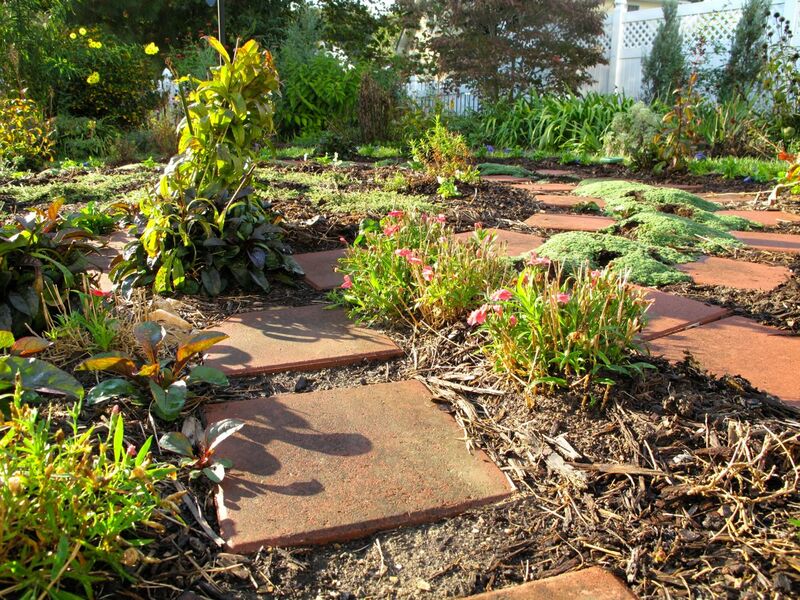 Early morning cleanup revealed a broken ‘Chuck Hayes’ Gardenia, a crushed Buddleja, a flattened Gaura and a few missing perennials, but mostly the garden was spared. It still looks a bit bruised though and will take some time to recover it dignity. It is too soon to see this as an opportunity to redesign, but eventually it will work that way. 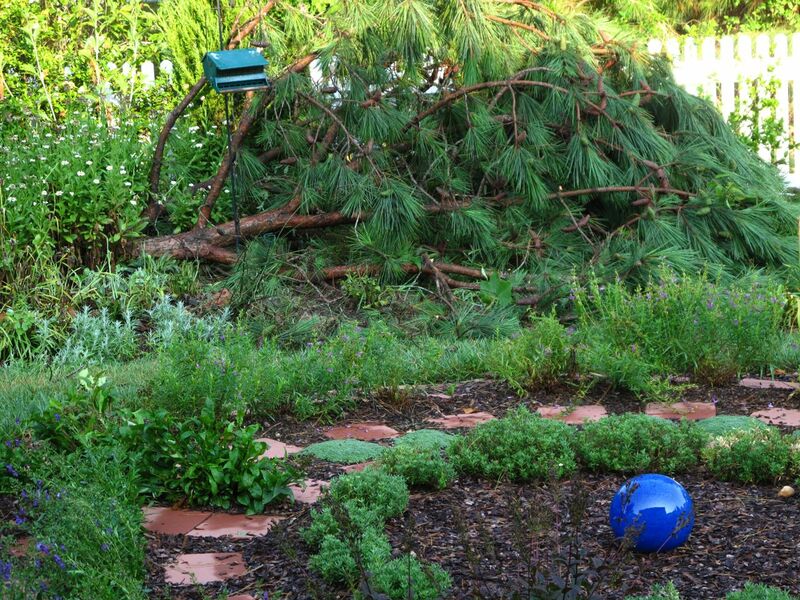 This entry was posted in garden, pbmgarden renovation and tagged Crape Mytle, loblolly pine, meditation circle, summer garden, wind storm damage on July 7, 2012 by pbmgarden. 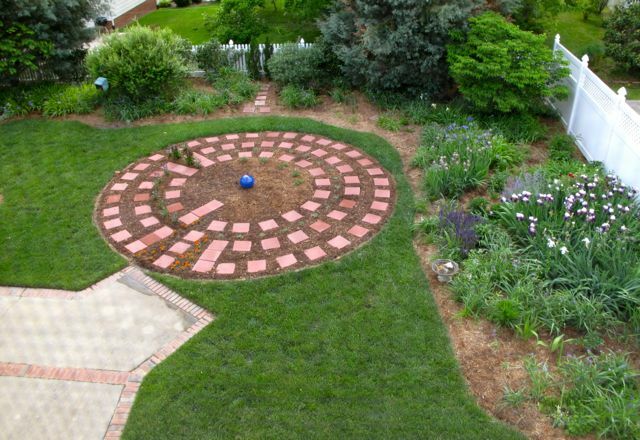 I embarked on a major garden renovation in January 2011, installing some new privacy shrubs, a picket fence and a meditation circle with a labyrinth. 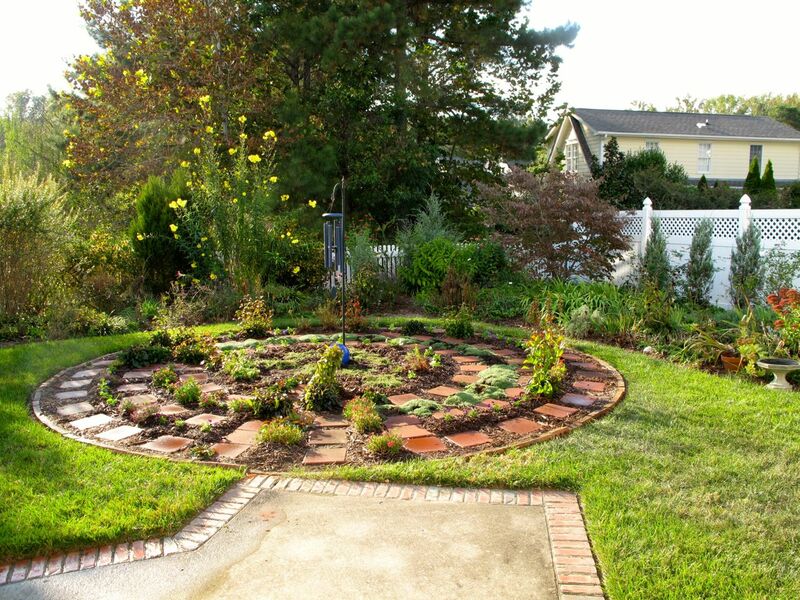 These projects made a large impact on the garden and measurably increased my enjoyment of it. 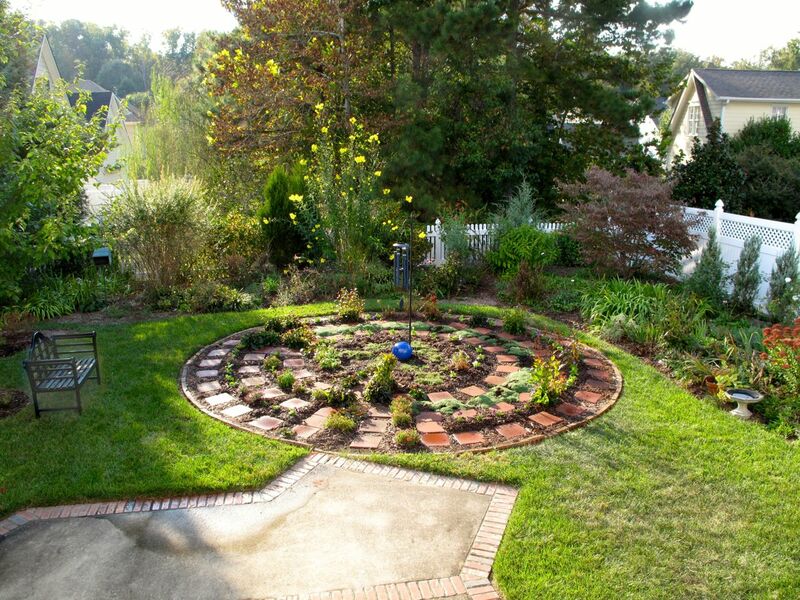 So I coasted for a year, just enjoying the flowers, but lately I have begun thinking again about various aspects of the garden’s design, structure and views. 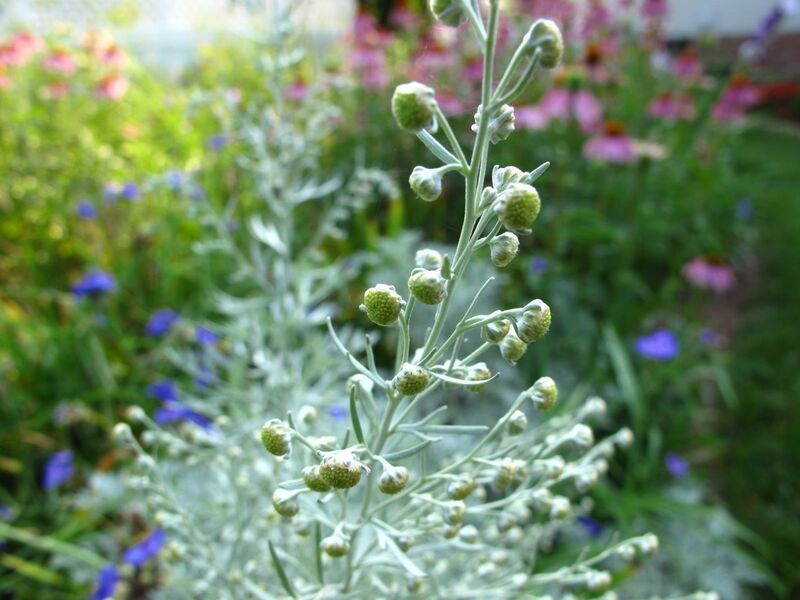 Fortunately Christina at Creating My Own Garden of the Hesperides hosts Garden Bloggers Foliage Day (GBFD) each month, and this prompt provides an opportunity to examine the role foliage plays in the garden. Summer officially arrived this week and temperatures in the nineties reinforced this changing of the season. 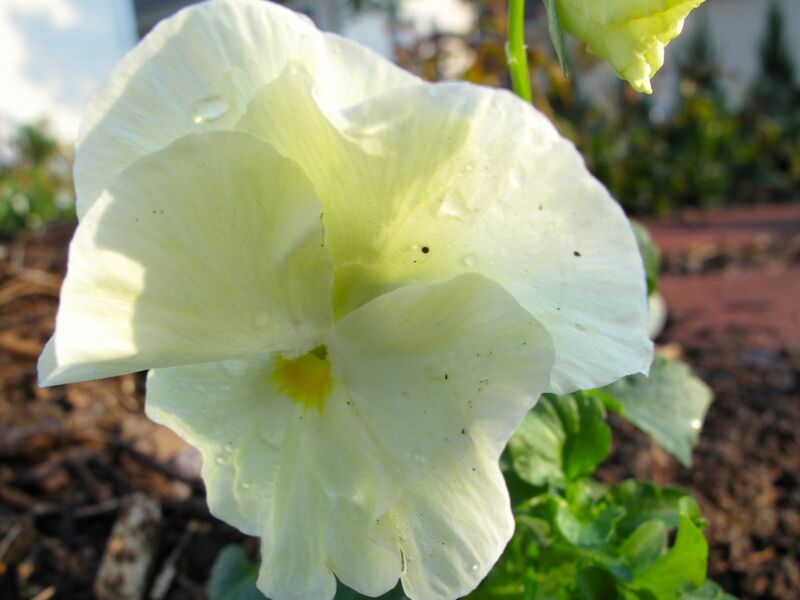 This time of year the sun’s glare can pale even the strongest-colored blossoms, making the garden appear washed out. 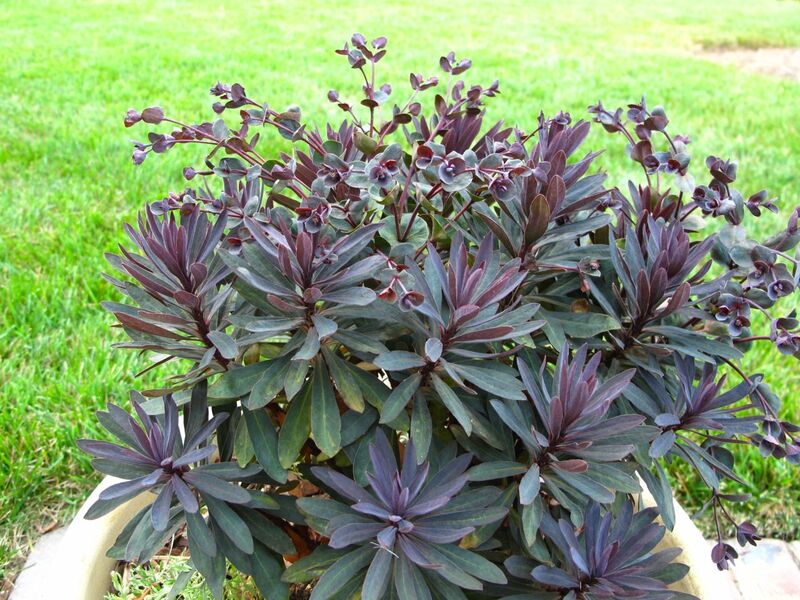 Strong foliage color and varying texture can add interest, especially during these next couple of months. 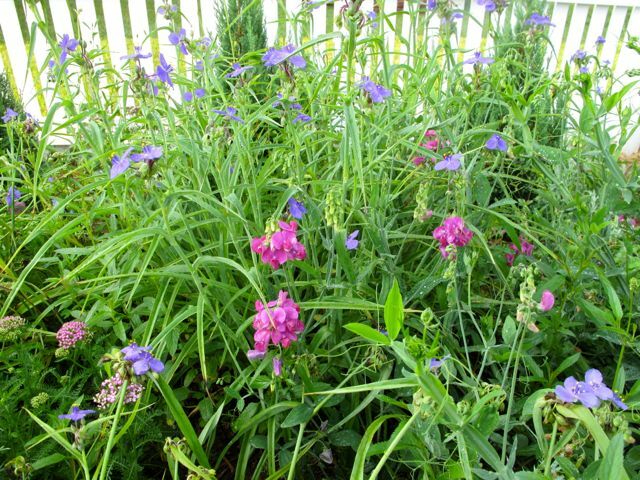 I am often drawn to plants with leaves of deepest greens, reds and purples and find these plants help anchor the garden in summer. 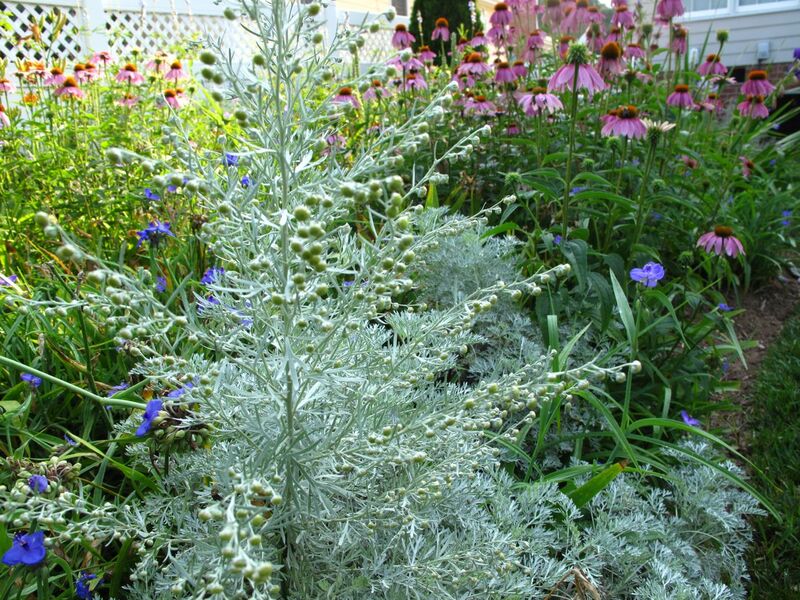 Silvery foliage, such as that found in Lavender, Dusty Miller and Artemisia, is equally useful and serves to complement the dark-leafed plants. 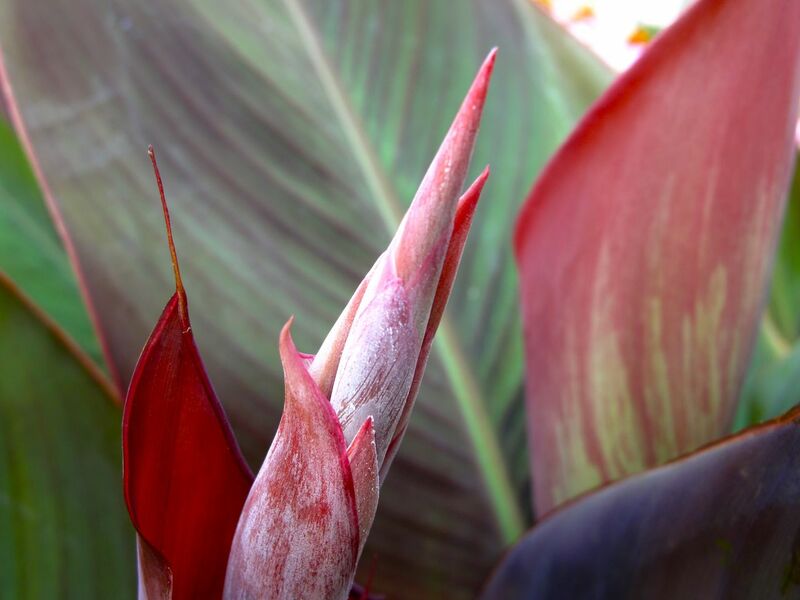 Canna’s strong form and deeply patterned, smooth, waxy leaves add interest at many levels as it grows. 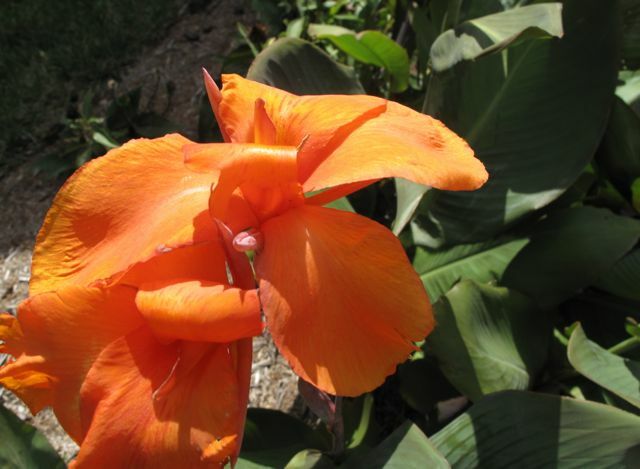 This week the first reddish-orange canna flower appeared. 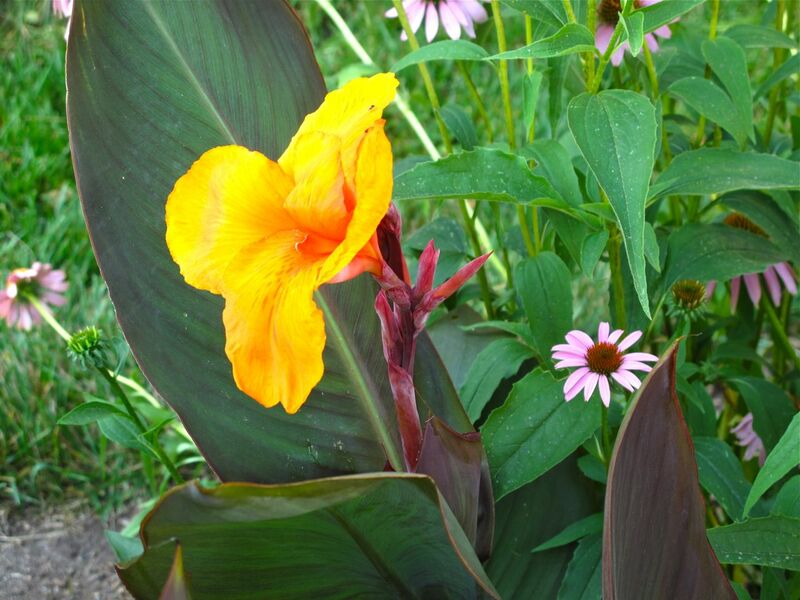 (The actual blossom looks yellowish in this picture, but in fact is orange, similar in color to that of the Echinacea cones in the background.) 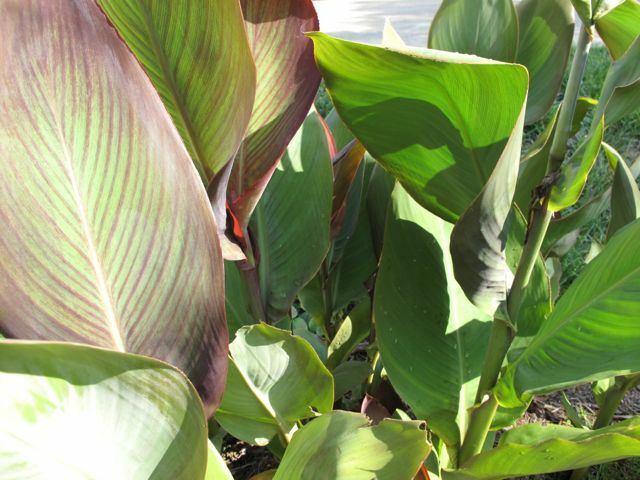 The long, slender leaves of Echinacea purpurea (Purple Coneflower) are quite graceful and delicate when juxtaposed with the boldness of the Canna’s leaves. Several weeks ago I transplanted some of the volunteer Cleome (Spider Flower) seedlings from the Southern path to other areas of the garden that needed filling in. 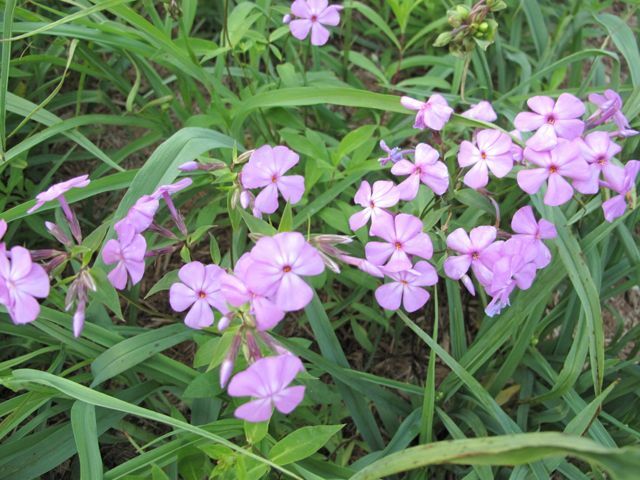 These transplants have not grown very tall yet, just 2-3 feet, but they can reach 4-5 feet. 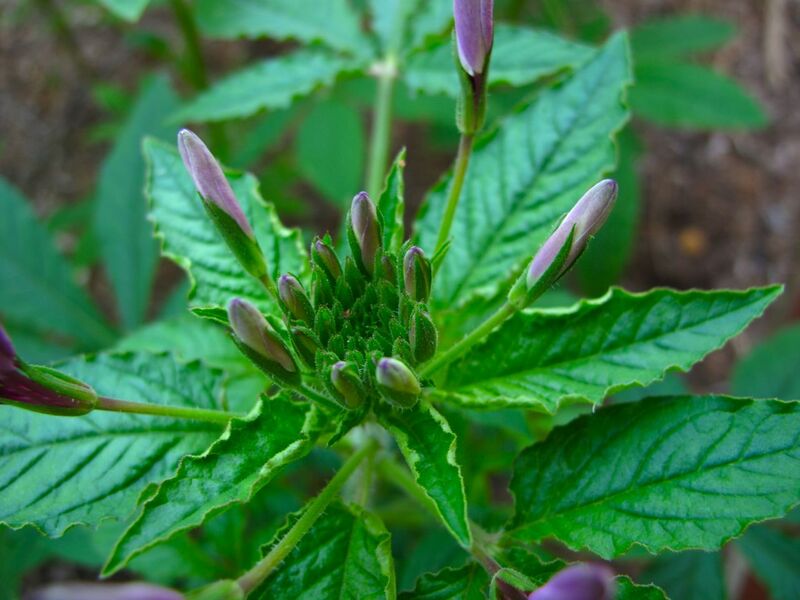 The medium green palmate leaves are but one part of the interesting and complex structure of Cleome. 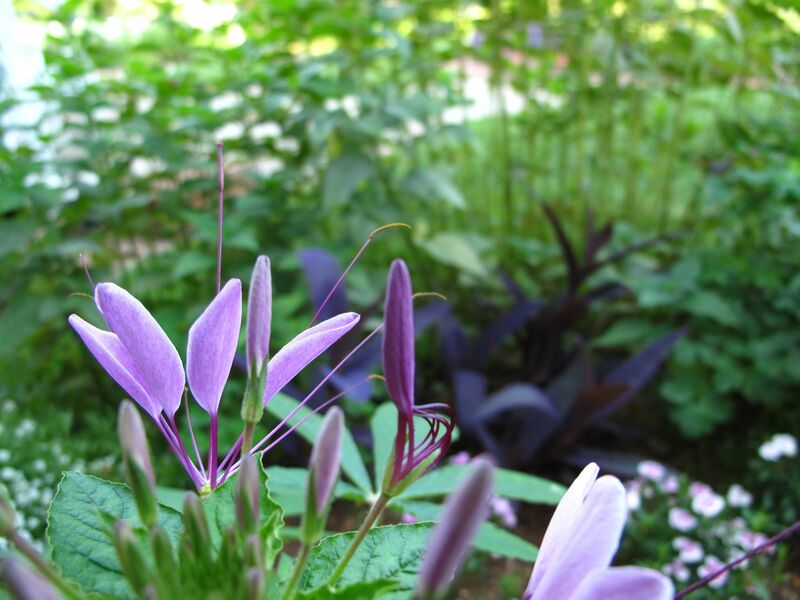 This Cleome below is opening in front of a stand of Monarda stems; the mid-range dark purple is Setcreasea ‘Purple Heart,’ a reliable plant used as a ground cover in this garden. 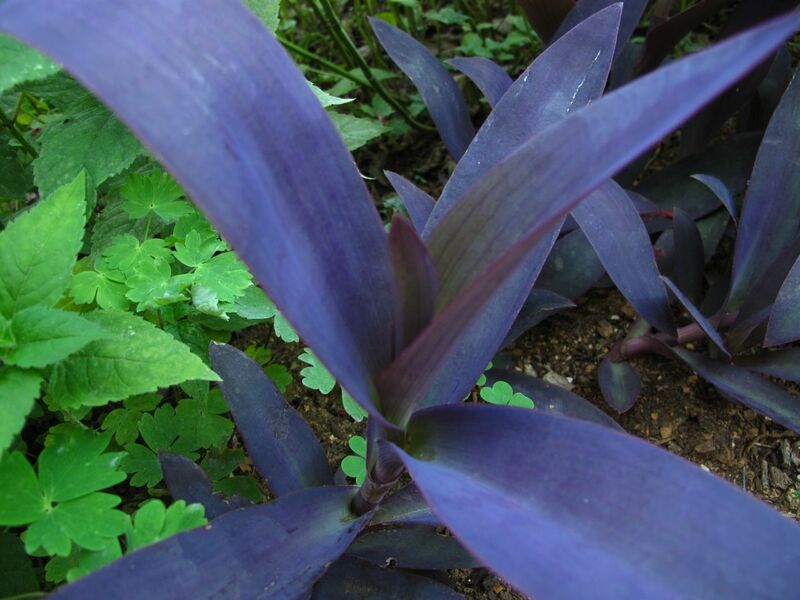 A gift from a friend many years ago, Purple Heart dies back but easily survives the winters here. 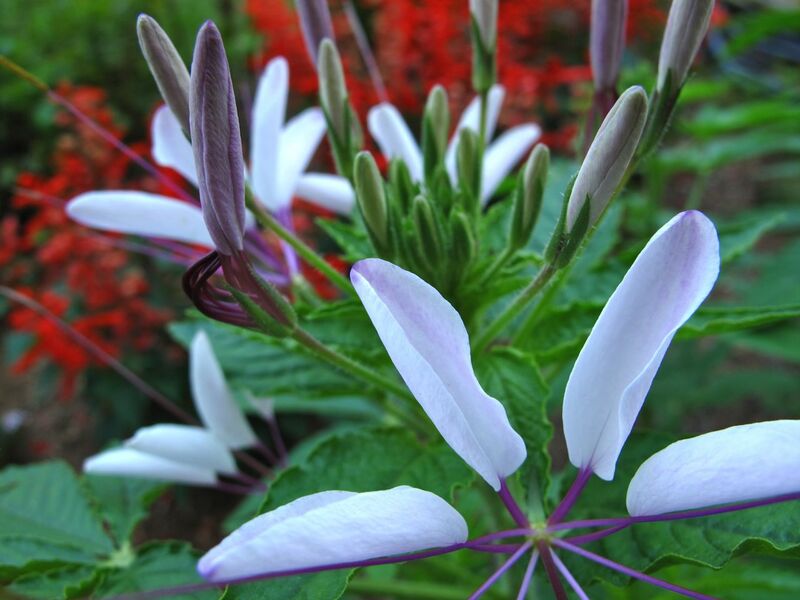 When viewing the Cleome flower from above, the foliage assists by providing the perfect backdrop for the flower to be seen. 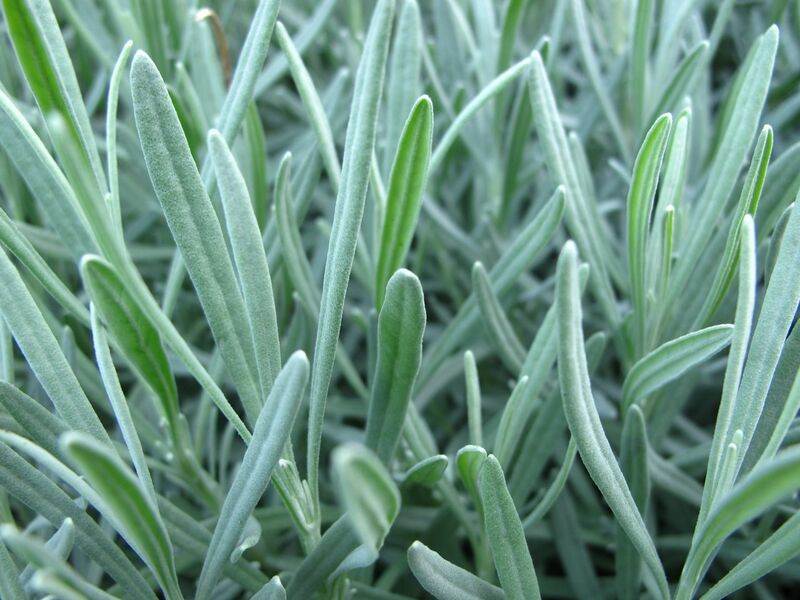 The garden holds many examples of foliage variations, but over time as plants have migrated, decreased, multiplied or died out altogether, many original plant pairings have ceased to exist. Much of what is left is happenstance. 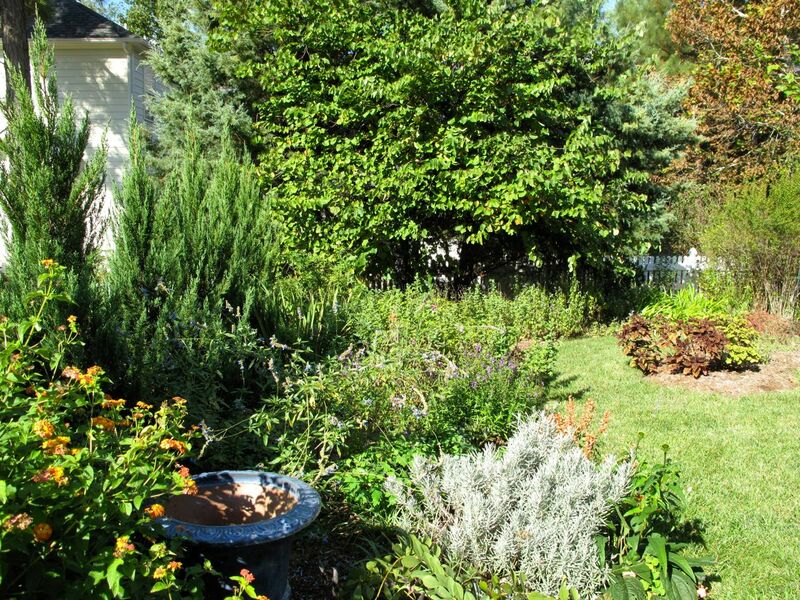 As I consider the garden’s overall design, I need to look closer at foliage and other characteristics of plants in the garden, noting what combinations work well and under what circumstances. Check out other GBFD bloggers by visiting Christina at Creating My Own Garden of the Hesperides. 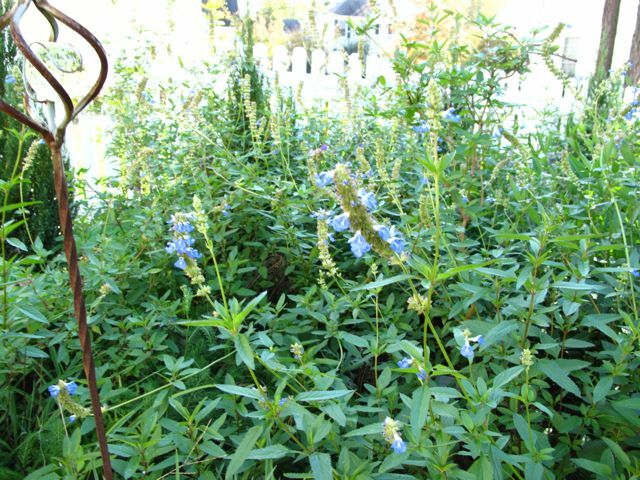 This entry was posted in garden, pbmgarden renovation and tagged artemisia, canna, cleome, euphorbia, foliage, Garden Bloggers Foliage Day, GBFD, lavender, nature photography, photographing nature, Setcreasea 'Purple Heart' on June 22, 2012 by pbmgarden. 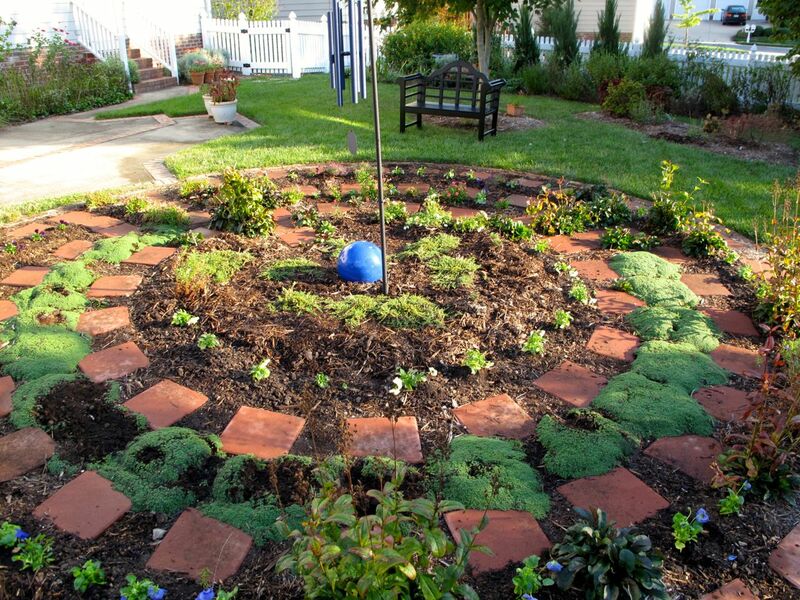 Today the plantings in the meditation circle seem a tiny step closer to being complete. 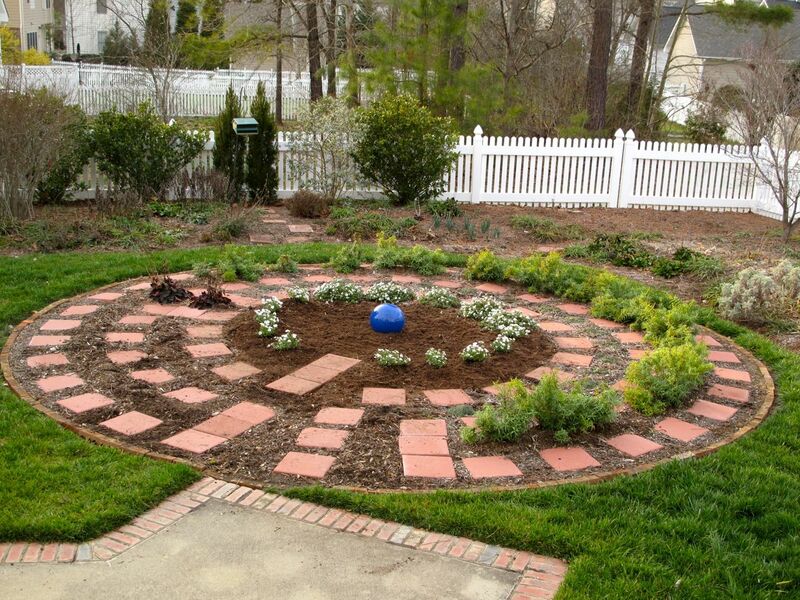 After months of indecision I decided to continue planting the goal of the labyrinth with Iberis sempervirens ‘Purity’ (Candytuft). 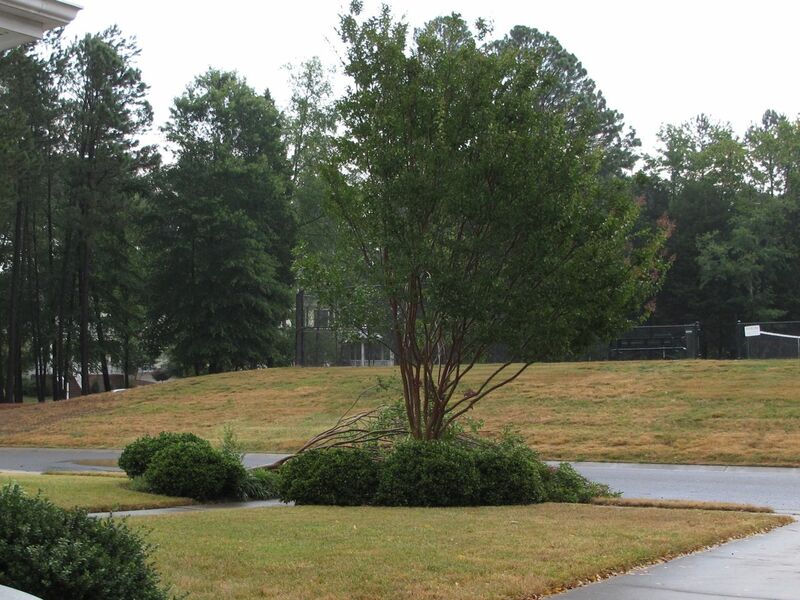 In addition to forming evergreen mounds, this cultivar is reputed to be tolerant of a wet or a hot dry site, and it also tolerates humidity. It has already proven itself under these conditions in the labyrinth during the past year. 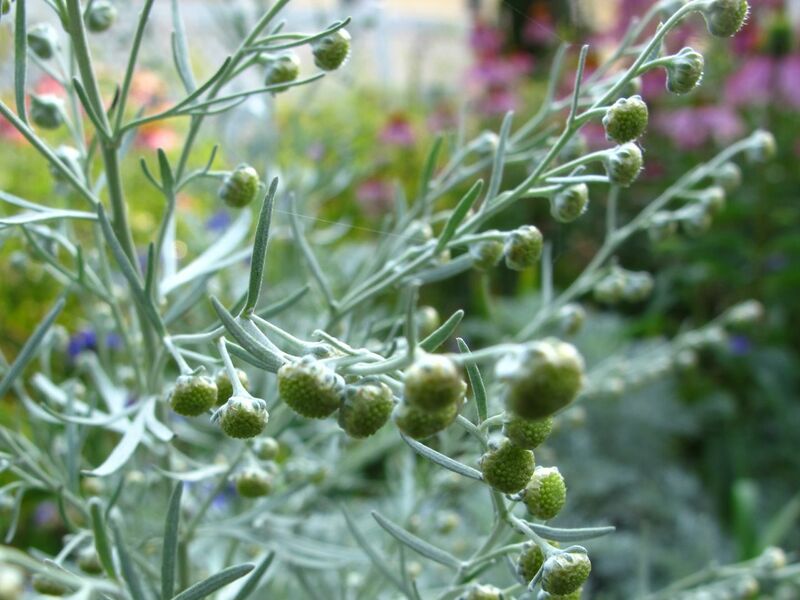 When the labyrinth was built last March, five ‘Purity’ candytufts were selected particularly to satisfy one major requirement: staying evergreen. 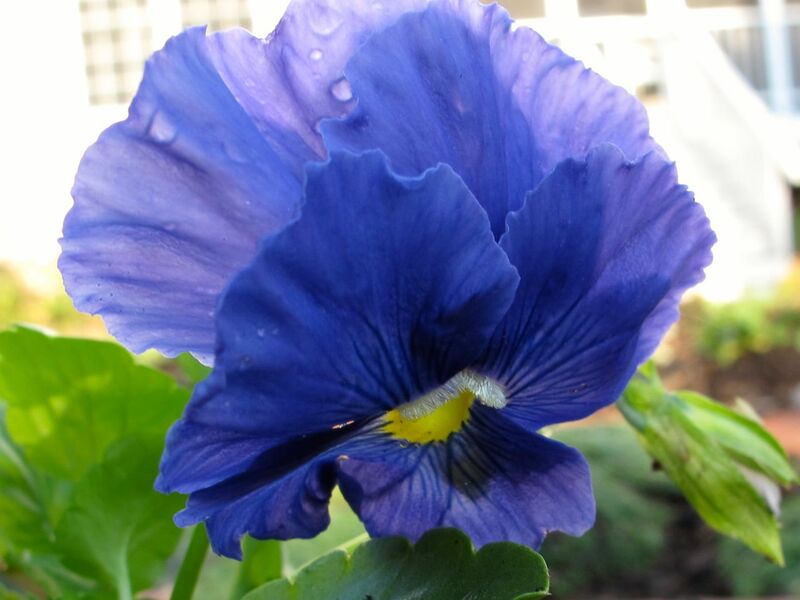 Of course it has been extraordinarily mild this winter, but they met the requirement and more by blooming since the first week of December. A bonus, these flowers are lovely in moonlight and tonight the moon is full. So, the innermost circle is joined. More plans await. 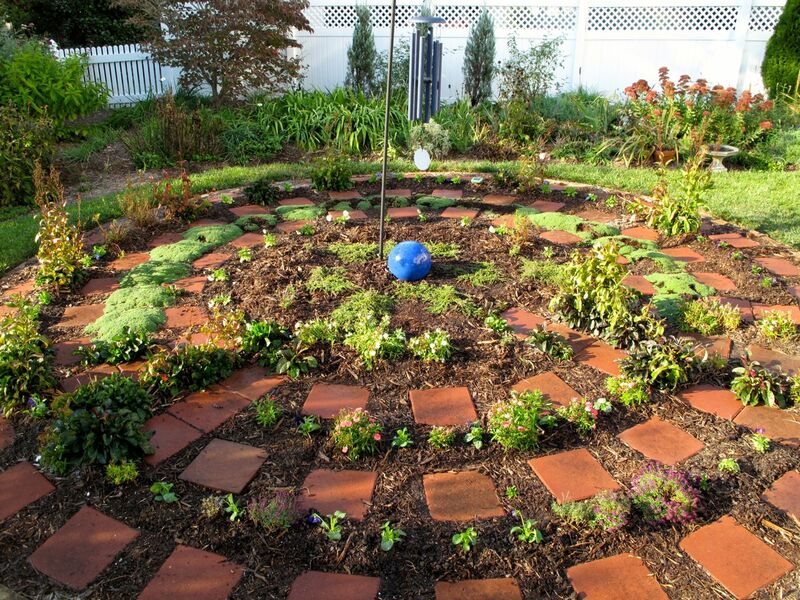 This entry was posted in garden, pbmgarden renovation and tagged iberis sempervirens, iberis sempervirens 'Purity', labyrinth, meditation circle, meditation garden, moonlight garden on February 7, 2012 by pbmgarden. Contemplating yesterday how best to proceed with my garden renovation started last year, it dawned on me how much my garden resembles my attic. A recent attic cleanup effort resulted in many donations and a few trips to the dump–hard work and satisfying. Now someone else can enjoy the colorful elephant and 3D puzzle. Despite the improvement the attic remains filled with a large number of items that simply entered my life at some point. For whatever reasons they were introduced, collected, saved and are now still a part of my life. Like the lathe-turned rocking chair, built more than fifty years ago by my carpenter craftsman grandfather, some attic treasures are cherished as a way to remember my family. These items are part of my childhood, my heritage, and I hope one day someone close will want them. There is always enough room in the attic to keep these treasures. Other things in the attic are oh so very useful, such as the large blue-speckled enameled canning pot I bring out to make watermelon pickles. Never mind it has been more than eight years since the last batch of pickles emerged from a steamy water bath in that porcelain pot. I still embrace the idea this canner still could be called upon any day. Then there is the other stuff. Some of this stuff is not valuable, like old papers no one else would care about–too boring to look through, but possibly too important to simply discard. 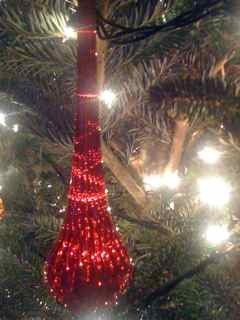 There definitely is good stuff too though: photographs, extra Christmas ornaments in perfect condition; numerous books (classics); musical instruments; many useful things maybe someone might want. So, after this recent, frenzied cleanup effort, the attic still needs attention and organization, and thus it is with my garden. 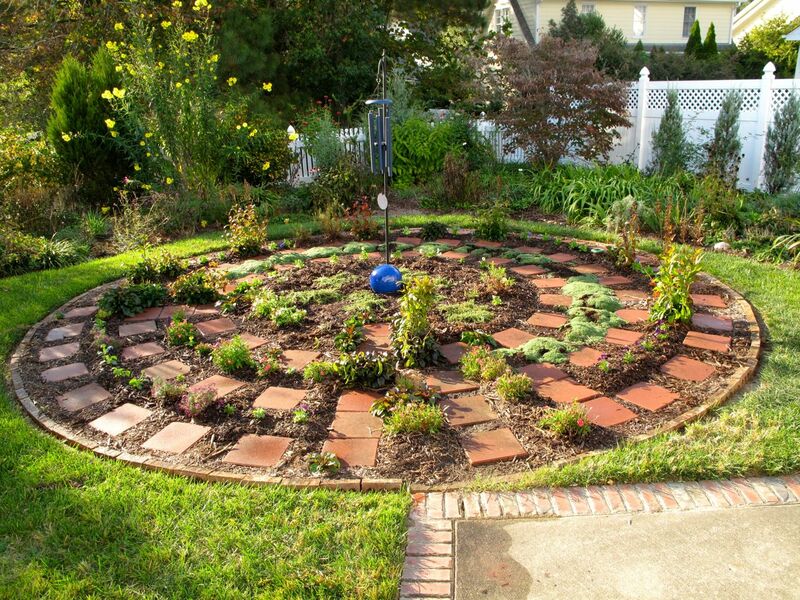 In the past year I have added a juniper shrub hedge, a meditation circle with a labyrinth and a picket fence around the entirety. 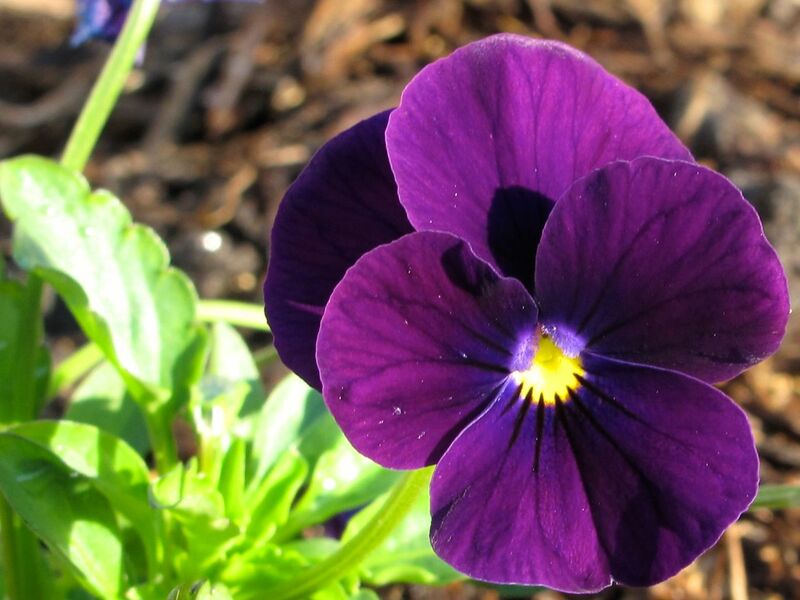 I have enjoyed gardening more than ever, weeding, trimming, planting and delighting in the cycles that take blossoms from newly opened toward waning. The garden has some beautiful moments. 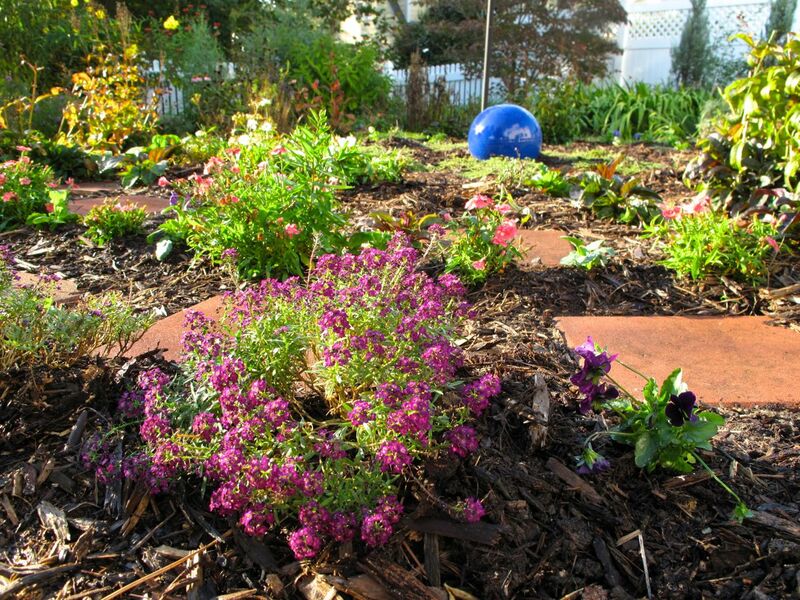 Yet, looking out on this wintry day my 10 year-old garden feels like an attic, a quarter-acre room filled with perennials that fondly became part of my life at some point. As I think about plant height, size when mature, color combinations, texture, light requirements, it hits me that I am working with a garden attic full of treasures and stuff. 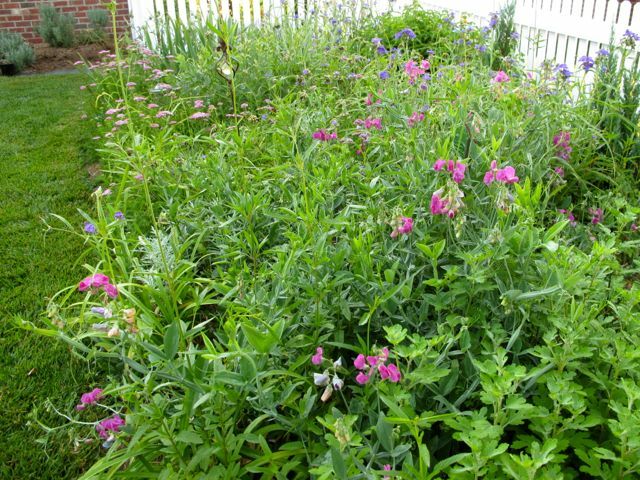 woodland phlox, an old-fashioned rose, tradescantia and sweet pea, rose campion, dusty miller, columbine–these pass-along plants formed the beginning of my very first garden. They were the first couple of boxes in the garden attic. I love them and can always find reasons to keep them. Other things in the garden are useful plants I want to keep where they are for the time being. (Remember, I just do not want to make those pickles right now.) 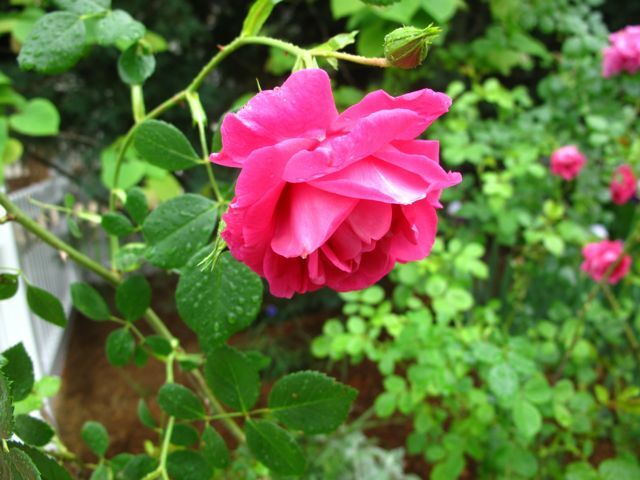 Some plants that are reliable through periods of drought or heavy rain or severe cold or those that manage to bloom when it is 100 degrees for 5 days in a row, those plants fulfill a purpose in the garden. It would not make sense to get rid of those or disturb them until there is a good design plan in place to replace them. And so, year after year the lamb’s ear keeps spreading, the daylilies attract deer, the ‘Blue sky’ salvia crowds and intertwines with everything; however, again this year, the garden might need some reliable bloomers, some things to fill up an empty space here and there–better hang on to these for now. So the boxes keep accumulating in the garden attic. 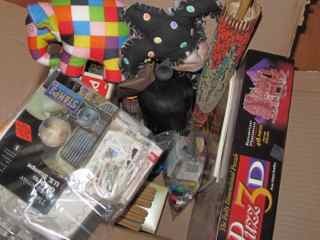 Then there is the other stuff, mostly good stuff too that just needs so much sorting out. 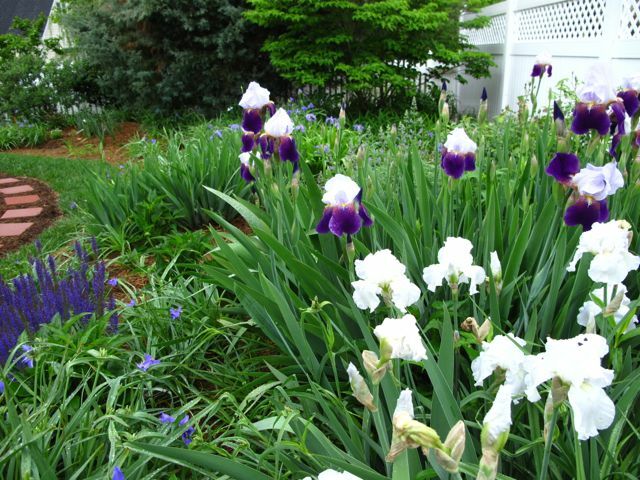 Plants like irises, pink yarrow, tansy, canna and others need to be dug and divided, replanted, relocated. I never seem to get around to it, but when I do, these will yield leftovers to be donated, useful plants maybe someone might want. 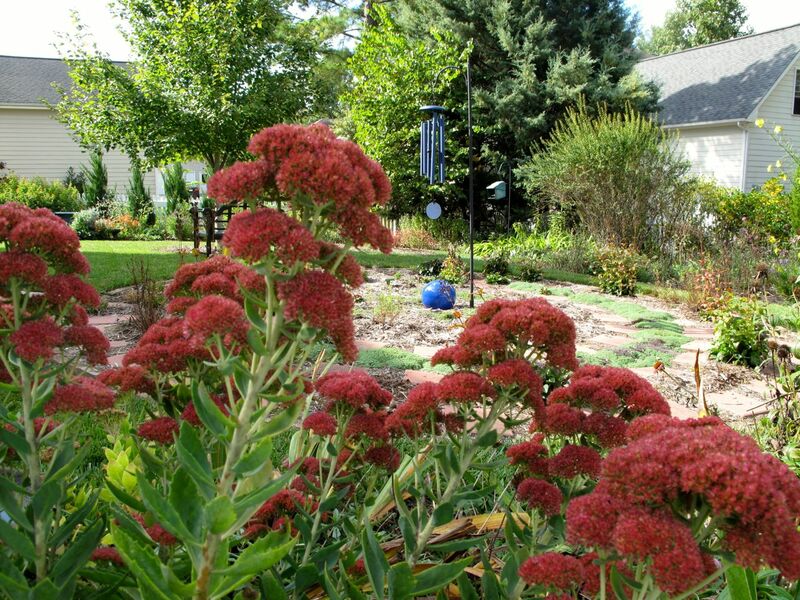 The garden has evolved over time and filled up with treasures. Now it needs a strong design plan, it needs structure and discipline. What a great time this would be to organize a serious cleanup in the garden attic. If I do not make some ruthless decisions now, once the spring flowers start blooming I simply will not have the heart to even think about it until next winter. 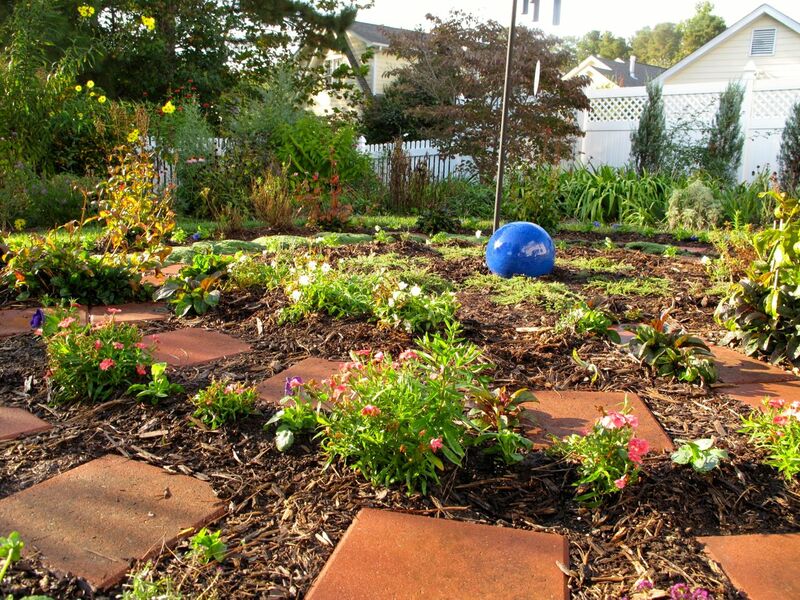 This entry was posted in garden, pbmgarden renovation and tagged garden design, garden renovation, pass-along plant, perennials on January 15, 2012 by pbmgarden.